Finding the link between Chardonnay, Yalingup in Margaret River and a Michelin starred restaurant in Little Bedwyn is the sort of puzzle that might even challenge some of the teams competing in Radio 4's 'Round Britain Quiz'. Chardonnay has plenty to appeal to the vigneron. Remarkably unfussy in its requirements, this vine grows anywhere from England to Argentina and for devotees in cooler climates, has the great advantage of ripening relatively early in the season. The other side of that particular coin presents its own problems as buds are forming while Jack Frost still lurks to nip them hard. Early season frost management therefore occupies the mind of the producer. The advantageous early ripening must also be watched carefully because if left too long, the grapes will very quickly lose the all-important acidity required in good wine, in favour of high sugar levels. Differing clones, terroirs and winemaking styles contribute to the wide flavour profiles of this varietal all of which provide the broad canvass onto which oak flavours can be layered. If overdone, the result can be overpowering both to the varietal flavours and the drinker and this probably accounts for the fashionable distaste that sprang up in the 80s and 90s. By contrast when done well, wines of tremendous style complexity and longevity are produced as the great white wines of Burgundy clearly demonstrate. Great chardonnay is thankfully not just the preserve of France and the wealthy. A number of new world exponents would be most emphatic about that and some of them ply their trade in the southwestern extremity of Australia. Margaret River is both the town and watercourse that sits centrally in the oblong peninsula jutting into the ocean south of Perth. A reliably warm climate moderated by coastal breezes contributes to a near perfect grape growing part of the world. Chris and Jo Davies own a 60 hectare estate at the northern end of the peninsula, of which 6 hectares have been carefully selected for viticulture with the remainder remaining largely untouched natural bush. Their philosophy is that wine is made predominantly in the vineyard and consequently, with the exception of harvest time, nobody other than Chris is allowed to touch his vines and his pursuit of excellence does not stop there. Hand pressing, natural yeast fermentation, and hand plunging also occupy him in the winery. It is hardly surprising that James Halliday is not alone in recognising Windows Estate as a 5 red star winery. Matching this, Jo runs the estate shop window and has gathered the 'best small producer cellar door' accolade for the last 3 years. High critical acclaim and small scale production mean that Windows Estate wines are not that easy to come by, indeed their very best 'petit lot' cuvees have only a 600 bottle run and sell out on the day of release. As the UK agent for Windows Estate, we found ourselves invited to the Mamba Riedel Decanter wine awards in 2016. 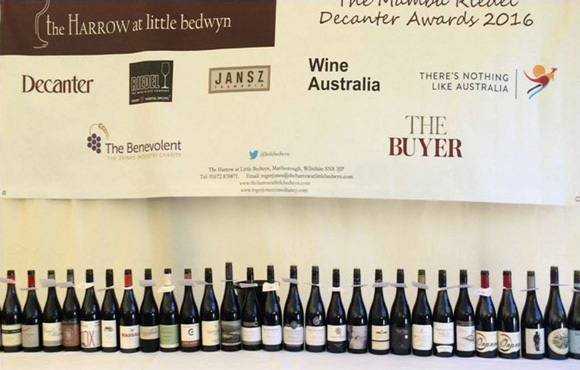 Roger Jones, the chef proprietor of the Michelin-starred Harrow at Little Bedwyn, organises this trade competition to showcase the very best of Australian wine available in the UK with the focus on this occasion being Chardonnay and Pinot Noir. So there we were, judging some 69 chardonnays and 35 Pinots noir alongside Steven Spurrier and other invited members of the wine trade representing their organisations. Steven Spurrier concluded from the event that Australia is 'second only to France as far as Chardonnay is concerned'. We of course have to declare our bias and interest, but both John and I felt that Chris and Jo's 2013 Chardonnay had such a pure intense expression of the chardonnay fruit supported by such elegant use of oak that it clearly outshone many of its more expensive rivals. At this particular event the wines are not tasted blind and the prices were also published so I was not particularly surprised to learn that the winning wine retails for over £90. In that context, given the individual attention to detail provided by Chris in his winemaking, the Windows Estate 2013 Chardonnay, though at the higher end of the HC Wines price range, represents extraordinarily good value for money.